After our (far too…) eventful weekend in London, we boarded a train bound for Glasgow, Scotland. Since we weren’t able to manage any time spent touring England, we decided to travel as much as we could by rail so we could at least “see” some of the countryside. The trip from London to Glasgow was a very pleasant 4.5 hours by first-class rail. We stayed in the town of Lanark while we were in Scotland, which is about half-way between Glasgow and Edinburgh. I absolutely loved our little beautifully decorated three bedroom apartment in Lanark. We were a two minute walk from a Lidl grocery, two minutes from a park that Artie could play in, and a three minute walk from the heart of downtown. After our terrible accomodations in London, this place was a breath of fresh air. The river Clyde runs through Lanark. While we didn’t see any Clydesdale horses while we were here, this is the area (Lanarkshire) that they originally hail from. We did visit the Falls of Clyde though, which are beside New Lanark where there is a working wool mill and a living history museum dedicated to telling the story of the mill and the Industrialization of the area. While we were in Ireland, I bought a lot of Donegal socks, which were made just north of the cottage that we stayed in. The wool for those socks was actually turned into yarn at the factory in New Lanark. The world is small. We made a couple of trips to Edinburgh during our stay. The drive brought us by many purple, heather-covered hills. I’d heard of these purple hills before, but it was something special to see them in person. The Gothic feel of Edinburgh is like nothing we have ever encountered before. It feels as though you have entered the pages of a fairy-tale when you walk through the streets of the city. The Fringe Festival was going on during our visit. Some people may really love the extra “energy” that comes along with the massive influx of people present in the city for the festival. It was a few too many people for our liking. 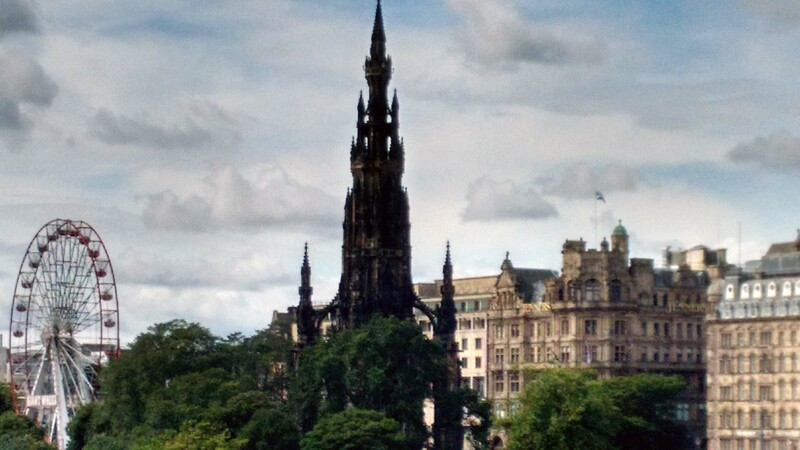 This spire is part of a massive and intricate monument to Sir Walter Scott. Just outside of Edinburgh, is Rosslyn Chapel. This 600+ year old chapel was made famous by Dan Brown’s book “The Da Vinci Code”. Photography inside the chapel is not allowed unfortunately. We spent a good hour inside just staring at the thousands of carvings on the walls, ceilings, pillars, walls, windows… it was amazing. We’re in the process of packing up to leave Scotland as I write this, and this is likely to be my last post for “Year 1” of our trip. Our family left Canada 359 days ago, and in two days we will be flying back to Toronto (via Dublin). Spending the last four weeks touring Ireland and the United Kingdom with my Mother has been a beautiful experience, and I love that we all have shared memories of our time and adventures in these countries together. Thank you for sharing your past years travels. I looked forward to your posts and felt I was travelling along with your family. What an adventure and I am so glad you could share it with all. Looking forward to Year 2. Safe travels back to Canada. Maria – so good to hear from you 🙂 Thank you for your kind words – we appreciate them. I’m glad that you enjoyed “travelling along with us” this past year.